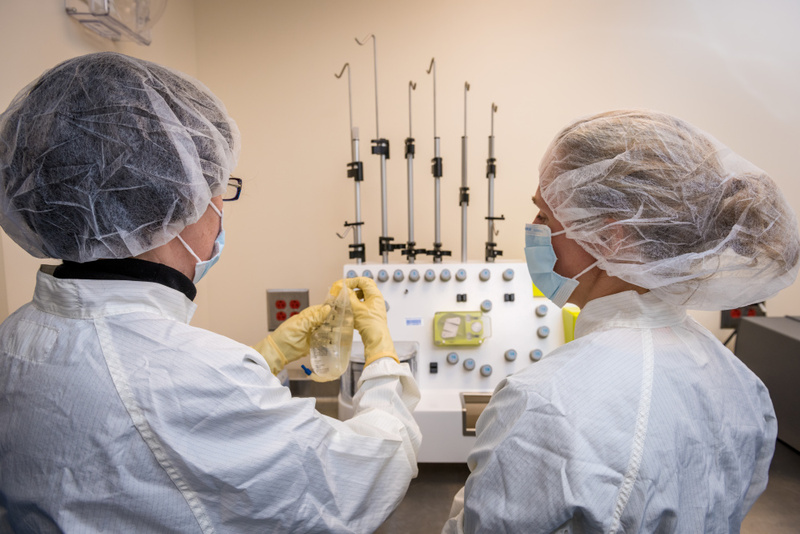 Dana-Farber researchers working on CAR T cells in the Institute’s Cell Manipulation Core Facility. CAR T-cell therapy is a kind of cellular therapy, which uses a patient’s own immune system cells to rally an attack on cancer. They’re made by removing a specific set of cells from the blood, modifying them in a lab to intensify the immune system’s natural response to cancer, and re-injecting them into the patient. CAR T cells are a form of cellular therapy that has produced exceptional results in some patients and is being tested against a variety of different cancer types. Both CAR T-cell therapies and therapeutic cancer vaccines are considered immunotherapies because they work with the immune system to fight cancer. However, they differ from other immunotherapy agents known as immune checkpoint inhibitors, which aim to lower the barriers that can keep the anti-cancer immune response in check. CAR (for Chimeric Antigen Receptor) T-cell therapy uses specially engineered white blood cells called T cells to lead an assault on cancer. T cells’ role in the immune system is to hunt down and destroy abnormal cells, including cancer cells. For a variety of reasons, however, they don’t always recognize cancer cells, or don’t mount an all-out attack on them, potentially allowing tumors to take root and expand. Turning them into CAR T cells seeks to overcome those deficiencies. To make CAR T cells, technicians collect a sample of a patient’s T cells from the blood and engineer them to sprout special structures called chimeric antigen receptors on their surface. When these CAR T cells are reinjected into the patient, the receptors may help the T cells identify and attack cancer cells throughout the body. As of May 2018, CAR T-cell therapy has been approved by the U.S. Food and Drug Administration as standard therapy for some adult patients with aggressive non-Hodgkin lymphoma that has relapsed after prior treatments, or has not responded to other therapies (refractory), and for patients age 25 and under with relapsed or refractory B-cell acute lymphoblastic leukemia. Therapeutic cancer vaccines – which are used to treat cancer rather than prevent it – are another form of cellular therapy. Some of these vaccines consist of dead cancer cells, parts of cells, or immune-stimulating proteins; others are produced by removing some of a patient’s white blood cells and exposing them to a protein from the cancer, along with a stimulatory molecule. What’s New in Cancer Immunotherapy? One type of cell-based vaccine involves removing certain immune system cells from a patient’s blood and sending them to a lab. There, they are exposed to chemicals that turn them into dendritic cells, which display cancer-related antigens on their surface. The dendritic cells are combined with a stimulatory protein that prompts a robust immune response on tumor cells. The newly energized dendritic cells are infused back into the patient through a vein. Provenge®, a prostate cancer therapy that is the only vaccine approved to treat cancer in the U.S., is an example of a dendritic cell vaccine. This approach is under investigation in other cancers as well. Another approach is to construct a vaccine out of cancer cells that have been removed from the patient during surgery. The killed tumor cells are processed in a lab to make them more “visible” to the immune system, then re-injected into the patient along with an immune-stimulating compound. The patient’s immune system launches a vigorous attack not only on the newly-injected cancer cells but also on similar cells throughout the body. Learn more about immunotherapy research and treatment at Dana-Farber. Are there any trials underway for Ovarian Cancer?